The best known musical scores library is IMSLP (International Music Score Library Project), also called the Petrucci Music Library, after publisher Ottaviano Petrucci. IMSPL is a project for the creation of a virtual library of public domain music scores, based on the wiki principle. It was launched on February 2006 by Edward W. Guo (pseudonym Feldmahler), a graduate of the New England Conservatory and Harvard Law School. Vladimir Viro, a computer scientist at the Ludwig-Maximilians University in Munich, Germany, is founder and lead developer of Peachnote, a classical music search tool. Vladimir Viro published a research paper on Peachnote at the 12th International Society for Music Information Retrieval (ISMIR) conference in 2011. The service enables a user to freely search IMSLP, the US Library of Congress, and other archives for classical music. 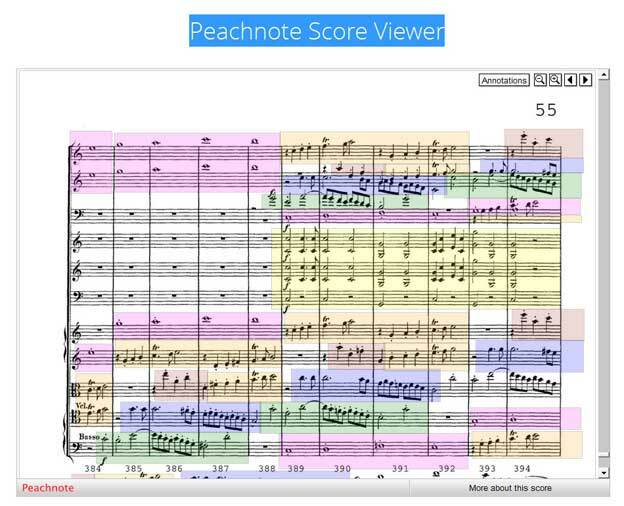 Peachnote uses a music N-gram Viewer, that’s analogous to Google’s N-gram Viewer. Michael Scott Cuthbert, Associate Professor of Music at MIT and creator of music21, a flexible toolkit for computer-aided musicology, is impressed by the impact of Peachnote on musicology. Vladimir Viro and Michael Scott Cuthbert presented their projects at the 1st Classical Music Hack Day which took place at the mdw-University of Music and Performing Arts in Vienna, February 1st – 3rd, 2013. 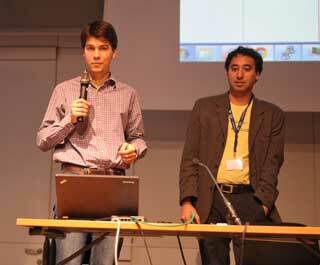 Werner Schweer, Nicolas Froment and Thomas Bonte presented at the same days their free open-source musical notation program MuseScore. The idea of the musical dice game is to cut and paste prewritten measures of music randomly together to create a piece of music. The random generation is done by a dice roll. The sum of the thrown numbers is looked up in a scoring table to determine which measure to play. Today, its W.A. Mozarts (1756-1791) “Musikalisches Würfelspiel” which became famous and succesful. This mucical dice game was first published in 1793, two years after the death of Mozart. The original manuscript nor a direct reference to Mozart were ever found, but his authorship is no longer questionned by musicologists (Köchelverzeichnis KV1 Anh. 294d, KV6-516F). I first heard about Mozart’s dice composer in 1991. The july issue of the Computer magazine Vol.24 No.7 published by the IEEE Computer society was dedicated to computer-generated music. The project overview of Stephen W. Smoliar “Algorithms for musical composition: a question of granularity; pp.54-56” mentionned Mozart’s work. The same year (1991), Chris G. Earnshaw from Cambridge, developped a computer implementation of Mozart’s dice game as a public domain program for the Atari computers. His version was based on the 1798 edition by Simrock in Bonn (reprinted by the Liverpool Music Press) of Mozart’s “Instructions to compose without the least knowledge of music so much german waltzer or schleifer as one pleases, by throwing a certain number with two dice” . Other programmers have written before him versions for the BBC micro and for the Sinclair Computer. Die erste Fassung des Programmes wurde am 26.11.2006 während eines Konzertes in der Philharmonie Luxemburg Festival “rainy days 2006”) vorgestellt. Die neue Fassung des Programmes wurde im Mai 2009 während der Foire de Printemps in Luxemburg vorgestellt und mit zwei Schülergruppen experimentell erforscht. This site is a very clever MIDI implementation of the game and allows you to compose your own Mozart minuet. A very nice implementation of Mozart’s game; the site is dedicated to mathematical challenges and educational experiences related to musical dice games. Bei diesem Mozart Würfelspiel wird nicht gewürfelt, sondern komponiert! Mozart was not the first composer who was interested in chance music and mathematical composition. 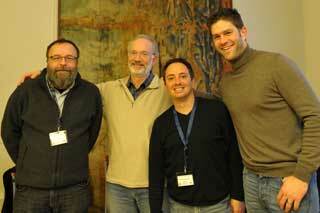 Other known authors are A. Kircher (1650), Mizler (1793), J. Haydn (1793), F.G. Hayn (1798), J.C. Graf (1801), C.H. Fiedler (1801), L. Fischer (1801), A. Calegaris (1801) and G. Catrufo (1811). The best documented historical work is Johann Philipp Kirnberger ‘s “Der allezeit fertige Polonoisen= und Menuettencomponist” published in 1757. 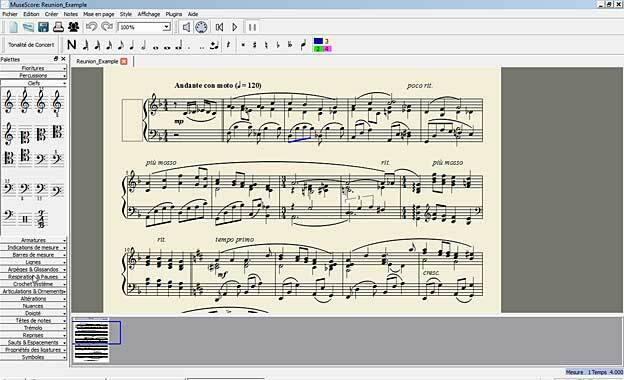 Schott Music, Mainz, published a software about musical dice games for Windows computers : Musikalische Würfelspiele, von Mozart, Haydn und anderen großen Komponisten. Aus Tabellen werden Takt-Kombinationen gewürfelt, die so klingen, als wären sie ganz individuell komponiert. Available on amazon.de.